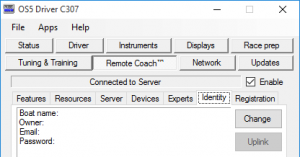 This post goes into the details on how to do registering of OckamSoft 5. OS5 Race The primary display for OS5, optimized for PCs. EyeApp™ The mobile app for OS5. ChartBrowser Downloads charts from the internet. LogScanner The log viewer with tack analysis capability. Driver Generates or accepts instrument data, synchronizes between other OS5 components and does the logging. OS5Starter Desktop widget to simplify startup. UDPmon Tool for observing and testing the UDP broadcast. WebItems Web browser and page editor for adding web pages to Race. Polar Ops Polar viewer and editor. OckamSoft 5 includes a fairly good simulator that sails continuously around any course you select. This lets you see how the apps work and how they will help you sail more successfully. Because the simulator allows you to learn how OS5 works without needing to put it on your boat, you can do this on your home PC at your convenience. After you have played with OS5 and determined how you are going to use it for real, the next step is to put it on the PC that will be used on your boat. And yes, it doesn’t have to be the one you were playing with. Just install another OS5 on the boat’s PC. The OS5 you may have installed on your home PC is still useful in that you can use it to run LogScanner to analyze the race logs produced by the boat’s OS5. To do this, create another Uplink that will register LogScanner on the home PC. In addition to the installation procedure you already followed, you need to hook up OS5 to your instrument system. Download and reference the OS5 Quick Start Guide for details on how to do this. The Uplink is the information we need to produce your registration item. Start the OS5 driver and select the Remote Coach/Identity tab. Press the Change button and fill in the information. Press the Uplink button and the uplink text will be copied to the clipboard. Paste the uplink text into an email along with a list of the applications you want registered and send it to Ockam. Ockam will return a registration file called ‘RegInfo.dat’. Be sure all OS5 apps are not running and then paste it into the OS5 directory (c:\OckamSoft 5). Then start the driver and go to the Remote Coach/Registration tab to confirm your applications are registered.